I am growing a variety of plants in my indoor winter garden, and will be growing many more outdoors in my expanded garden this year. With some plants it is fairly easy to tell whether or not they are in need of water. Other types of plants can be a little more difficult to tell if they are getting enough, or possibly too much water without sticking my fingers down deep into the soil. Just because the top soil is dry does not mean that some plants should be watered, or if the top feels damp, it doesn't mean that it isn't dry below the surface. 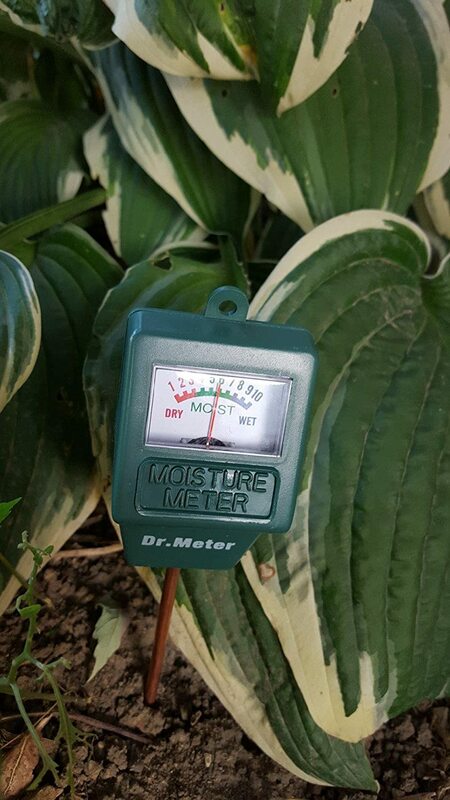 I have been using this Dr.Meter® Moisture Sensor Meter for the past week and have been truly surprised by the results in a couple of my plants. I love that it requires no batteries or electricity so it is easily portable, and can be used anywhere and any time you need it. This hydrometer is very easy to use. Just insert the 8 inch metal stem into the soil to root level, and watch the gauge move to display the results. The gauge on this soil water monitor has 10 levels of dryness. Some plants such as cactus prefer dry conditions, and when testing, these should be in the red range toward the bottom of the dryness scale. Plants like orchids prefer moist conditions and should register within the blue range at the top of the scale. Many plants prefer the green, middle range rather than being dry or moist. With this gauge, it is easy to tell what moisture level your soil is at. This gauge is suitable for both indoor and outdoor work, for houseplants, gardening, or farming. It is not intended to be left in the soil, just insert, read the level, then remove and clean the soil from the stem until the next time it is needed. There is a printed chart on the back of the package that lists quite a few plants, and which moisture level you are looking for for each of them. The list is not all inclusive, and doesn't show many of the plants I am growing, however it does show a pretty good variety of plants. Although I would have loved to have all my plants listed on the chart, I understand that it would be impossible to list every known plant without writing an entire book on the subject. If in doubt, I try to choose a plant that is at least somewhat similar to the one I am checking. Even without the chart though, if your plants are registering at one extreme or the other, unless you know the specific plant variety needs either a very wet or very dry soil, you can use this reading to try to adjust the moisture accordingly. I have used this meter on a couple of plants that I was recently been given and the former owners were shocked to find that the reason these plants weren't doing well was simply a matter of over/under watering them. These plants were in very poor condition when given to me, and are now looking much more healthy. I find that this moisture meter is a very useful gadget, and although some people need it more than others, it could come in handy for most gardeners at some point.